1) Brush your teeth 2 times every day. Use a toothbrush with soft bristles and toothpaste with fluoride. Fluoride is a mineral that helps protect teeth from decay. 2) Brush in circles and use short, back-and-forth strokes. 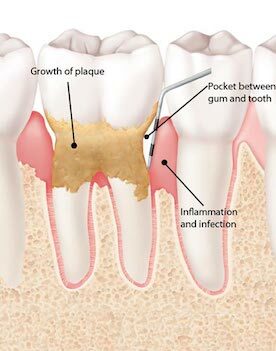 3) Take time to brush gently along the gum line. 4) Brush your teeth for about 2 minutes each time. 5) Don’t forget to brush your tongue. 6) Get a new toothbrush every 3 to 4 months. Replace your toothbrush sooner if it’s wearing out. If you aren’t sure how to floss, ask the dentist or dental assistant. What if I don't like going to the dentist? Choose low-sugar snacks like vegetables, fruits, and low-fat or fat-free cheese. Drink fewer sugary sodas and other drinks that can lead to tooth decay. People who use tobacco in any form (cigarettes, cigars, pipe, smokeless tobacco) are at higher risk for gum disease and oral (mouth) cancer. Take care of your children's teeth. If you have kids, help them learn good habits for a healthy mouth. Start cleaning your child’s teeth as soon as they come in. Snack on vegetables and fruits like carrots and apples.